It’s almost a thrill to listen to that clumsy version of “Long Tall Sally”, their first single.. It’s really an amateur band sound in retrospect (George Martin said that newer bands tend to record in a higher speed.. Emotions out of control? ), and not necessarily in the bad sense. They *mean it*, like The Beatles in their stuff pre “I Want To Hold Your Hand”, they’re hungry for more, baby. Ray wrote the flip side, and it’s hardly any better you know, but hey, family, friends, we were recording! It’s in the second single “You Still Want Me” (and the similar sounding “You Do Something To Me”, both sides written by Ray), where they really shine – a precious melody and hooks, and well, let me tell you, it’s the kind of frame of mind in the recording companies those days you had to change. Why recording covers? Not everyone could, but Ray COULD write. Those were harsh times and you had to get a hit, so we did that razor thing with the speaker and Dave came up with that feedback storm (it’s 1964, get this in your system! ), that piercing sting called “You Really Got Me”. In those times The Kinks were about electricity you know, so no big words from Ray, but he wrote a musical anthem for the early Kinks. It was a monolithic achievement. “It’s All Right” on the other side, was unremarkable: another “let’s all scream in concert” tune (a cousin of “I’m Alright” by the Stones, probably). .. But we accelerated a bit for “All Day And All Of The Night”. Certainly a successful clone, a sombre child of “You Really Got Me”, and I usually prefer the child, as it’s slightly darker, more intense, and obsessive. The B-side, “I Gotta Move” is very good, with a pretty crescendo at the end, as it never leaves the original punching beat (kudos to Mick Avory’s hi hat); also a much better realized song for a dynamic concert number (in this case, the Stones title-alike would be “I’m Moving On”). This was, dear friends, a single year in the life of The Kinks.. Evolution? Well I’d say quite some big steps for them and humanity, but they would be bigger steps next year. We, big Time Crooks, are looking for Heroes constantly. Or any source of flaming inspiration – almost the same, right? We look for signs, for last minute approvals to our risky self-challenges. BIG SIGNS (“In the end the love you make is equal to the love you take” What does it mean? Should I call her tonight and make a real move?). Music comes along in our life experience as one of our best pals. There are such big signs in music. And believe me I’m the first to love a Deaf Dumb and Blind Boy’s opera. Or a concept album about war dementia and absent father issues. But then you have Ray. And Dave. And The Kinks. The sixties, that was some bloody long decade. Fantastic: dramatic, tragic, funny, romantic. And we had heroes of all the colors and shapes. And we had The Kinks. 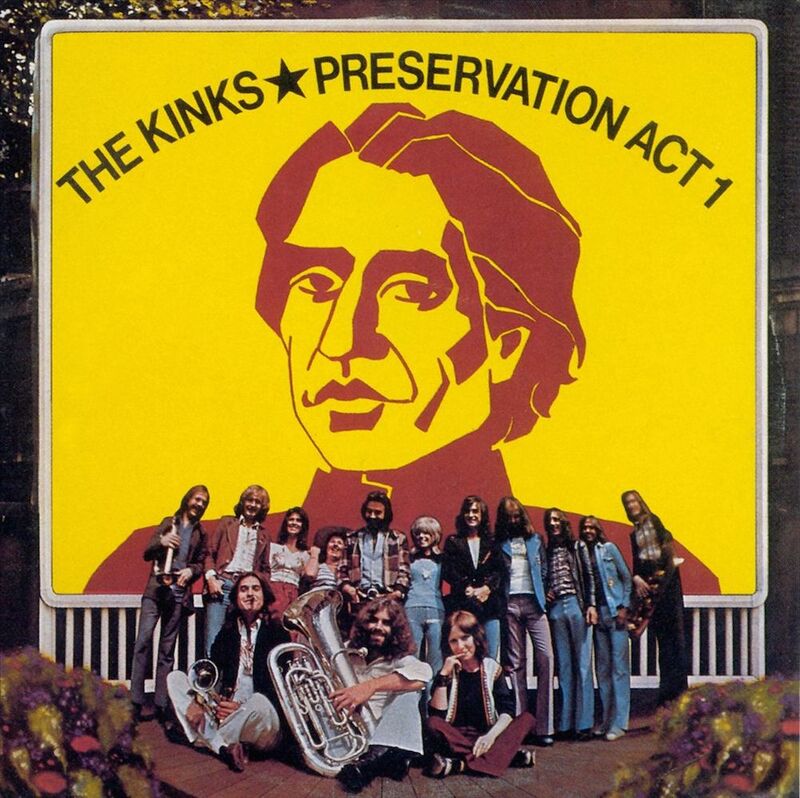 The band everybody loves to re-rate, because no matter what happens to bring them back from the dead (Internet, those expensive deluxe editions, anything), it’s always “Oh The Kinks, yes, the best band ever!” And then just “Ah. The Kinks. Yeah, pretty good. Play Led Zeppelin, please” – The Kinks are always underrated. Thing is, Ray designed that glorious but somehow ignored path from 1966 to 1969 and then he started to look back into Sweet Disdaining America. First it was “Lola” in 1970 – quite a success, to be honest (they didn’t get it, that’s why they bought it). BUT, then… Ray strikes back. This album stinks of cheap booze, faux western movies, runaway jailbirds, and sweaty toothless luck. Country and Western designed under the heavy smoke of London. Everything is wrong about Muswell Hillbillies. Maybe that’s why it feels so right. Ray, The Apeman, would always appear to be doing the opposite thing to what he was expected to do. Damn that thin guy doesn’t look that dangerous. But this music is .. provoking (provoKINK?) in its simplicity. In a way no tremendous anthemic Ode To God (however necessary, Happy Brian, we love you) may be able to. There’s that opening anti-overture called “20th Century Man”. Man.. What a depressing and still incendiary way to start an album. A real acoustic punkish frenzy. There’s this paranoia, delivered with that british quiet desperation that Roger Waters will define two years later, the “Acute Schizophrenia Blues” that should be Snowden’s first cover in America if he decides to record when he gets back home … Oh Forget it. This seems to be the point when Davies really starts to fall for a more theatrical approach, both musically and in terms of performance. The only way you may escape “The People In Grey” is sinking back in your raggy couch with some bottle and equally raggy memories – which may not even be yours. So as an antidote, you find those fake oldies like “Alcohol” (apparently in a live concert, it was a highlight, Ray had a Shakespearean actor inside him) or “Holiday”. And a little sparkle in the bouncy rhythm and the ironic message of “Skin And Bone” (Eating disorders, hello from 1971). For me there’s nothing as soothing as “Complicated Life” (“Life is overrated, life is complicated” – You bet, Ray). Or you prefer to listen to some Pretty Hollywood lie? Better stand and face it, I’ll say. From the bottom of the well we’ll try to find some peace. But there’s little. It’s a miracle that Ray can find a balance with the dreamy realism of “Oklahoma, USA” and its musical box beauty (“If life’s for living then what’s living for?”). And the musical box really extends to “Uncle Son” with that imported country vibe. It’s only with the upbeat ending of “Muswell Hillbilly” that you feel that somehow you gotta get your girl out (your cousin will do) and dance, and let her shake those long scruggy boots – be it in the shining beach shores of Rio de Janeiro, the endless plains of Buenos Aires or any other place you know of – Myself, I’ve not travelled that much as you see, but if Ray Davies could make such a successful American Country Rock album without a bit of guilt, I can gladly paint my town and in the process, paint the world. I’ll declare that this is Art for the Decades, with the advantage of being 45 years in the future. Thank you, Ray, for helping make this overrated, complicated life a quite acceptable place to live. I had never actually listened to The Kinks before outside of a few isolated songs, so I was excited to do my first full album by them. Unfortunately, I think I’m forced to agree with the mostly negative reception it’s gotten. The production is uniformly wonderful, which is a big plus, and musically a lot of the songs are pleasing enough. If there’s a plot to this rock opera, however, I can’t see one. Worse yet, the lyrics are utterly grating. Davies wants to be a cutting satirist but he paints with far too broad a brush and far too simple a sentiment to come off as anything other than smarmy a lot of the time. Where Randy Newman’s satire is horrifyingly cruel because it’s laced with empathy and pity, Davies clearly considers himself above most of the people he’s describing and treats them as such. It’s not amusing, it’s obnoxious. As said above, I mildly enjoyed a good deal of the album’s melodies, but they can’t rescue it from the lyrics for me. Having seen that this is generally considered the beginning of the end for the band, though, it won’t deter me from eventually seeking out their earlier work.